Matt received his Doctor of Physical Therapy from the University of Washington and began working at MTI Physical Therapy in October of 2015. 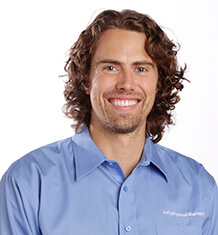 Aside from his experience in orthopaedic physical therapy, Matt also has a background in neurologic rehabilitation and developmental pediatrics. He enjoys working with all types and ages of patients and is passionate about helping people to achieve their goals and accomplish their full potential. He takes a comprehensive individualized approach to helping people restore natural fundamental patterns of movement and provide them with a better understanding of their bodies moving forward. Matt was a member of the University of Washington Rowing team, is currently a player for the Seattle Grizzles Australian Football Club, and participates as a partner with the Whatcom Slammer’s Special Olympics Basketball Team every winter. In his free time he enjoys a variety of activities including water sports, kickboxing, and playing the guitar.